Unleash your inner artist! Choose a photo canvas and express your creativity with Foto Brush. Just use your finger to make personal works of art that you can easily share with all of your networking friends or export and view on your computer. You can work with photos up to 2 mega pixels in size, so go nuts. Click “…More” to learn why you should download this App today! It’s fast, easy and fun to add a sports motif to children’s activity shots, dress up a grad photo or add some whimsy to that picture of your pet. Every photograph becomes a personalized expression of your sentiments that you can view on your device or export and enjoy on your computer. 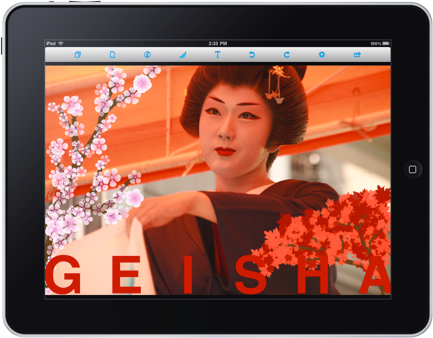 Foto Brush handles up to 2 MegaPixels, so your creations will look just as great on your monitor as they do your phone. Download the free version of Foto Brush (link below) to try before you buy. Foto Brush is an app that transforms photos into canvases on your iPhone, iPod Touch or iPad. Use your finger to add bold brush designs in unique combinations or choose from over 180 crisp shapes, objects and accent symbols. Checkout our video tutorials to learn more about Foto Brush.